To prevent certain health issues, such as diabetes and high blood pressure, it is important to stay active as we age. But as we age, we tend to lose the protective fat on the bottoms of our feet, causing irritation, heel spurs, etc. It also becomes more difficult to maintain our balance. That is why you need the proper walking shoes and staying active. There are different types of shoes recommended for different types of issues. Pronation is a natural part of walking where your foot rolls inward to distribute the impact on landing. Depending on the size of your arch, if you over-pronate or under-pronate (also called supination) then you’ll need a different type of shoe. Overpronators have a flat arch and an ankle that rolls too far inward, so their shoes will tend to wear on the inside sole. 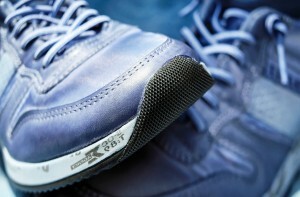 Motion control shoes are the best type for overpronators, they’re rigid and designed to equalize pronation. Underpronators have a high arch with an ankle that rolls outward. They should have shoes with cushioned, thick heels and flexible midsoles. If you don’t have either of these issues you are a neutral walker. Your shoes will tend to wear at the toes and should be designed for stability. Talk to your podiatrist to find out what type of arch you have and what shoe would be best. ● Avoid backless shoes, your shoes should hug the heel so your foot does not slide out. ● Look for shoes with good ankle padding, a thick sole, and good arch support. ● They should have a wide base for better stability. ● Look for velcro or tie buckles if you have trouble tying laces. Many shoes will have both styles so be sure to ask if you don’t see them. ● Try to get lightweight shoes. ● Talk to your podiatrist.